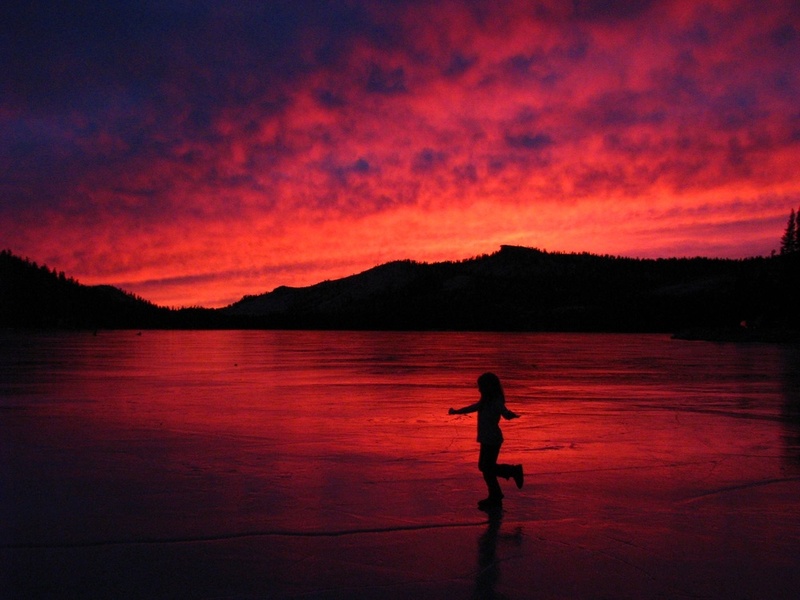 Sunset over Tenaya Lake (photo by Paul Amstutz)My friends Paul and Karen Amstutz took their family up for a skate on Tenaya Lake on January 2 and were gifted with a truly amazing sunset. At about 4 pm, I had headed down the hill back home from my trip to Tuolumne, and Paul and Karen considered doing the same as it looked like storm clouds were approaching. When the alpenglow kicked in the sky exploded in a fiery burst of color and instead of leaving, they remained to watch this mesmerizing scene. I am sad I missed it, but thankful Paul and Karen shared these incredible photos. Note from Paul: "Since there's been no snow this winter, we've been taking our 3 girls on a few "trans-Sierra-skate" trips. It's been fantastic to skate on June Lake, Gull Lake, the Tuolumne River, and of course, stunning Tenaya Lake. Being a California boy, I don't have much experience with frozen bodies of water, so these weeks have been extra special. In 25 years of living, working & playing in the Park, I'd have to say that skating on Tenaya, by moonlight, warm sunshine, and during astounding sunsets, has been one of my absolute Yosemite highlights!"